Enjoy this small community from choice Neptune Beach vacation rentals, providing accommodations to suit most tastes and budgets. Your visit to Jacksonville and the surrounding areas can be so much more satisfying in the spacious, refined houses, condos and villas provided for your vacation enjoyment or business excursions from Neptune Beach vacation rentals. A visit to the commercial area downtown allows you the chance to explore miles of sandy beaches, enjoy shopping from local merchants and eat at the downtown indoor and outdoor cafes, just off the wind-swept beach. Fishing, beach-going, water sports and ecotours dominate the local scene. Neptune Beach shares its revamped downtown area with the city of Atlantic Beach. The twin cities nestled on the shoreline of the Atlantic Ocean can provide necessities and adventures for the entire family. 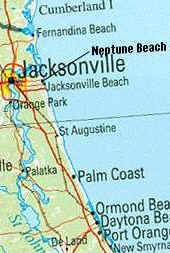 Neptune Beach vacation rentals can offer a fine beach location to stay when visiting the Jacksonville area.